Measure carefully, placing all ingredients except cranberries in bread machine pan in the order recommended by the manufacturer. Add cranberries at the Raisin/Nut signal or 5 to 10 minutes before last kneading cycle ends. Select Basic/White cycle. Use Medium or Light crust color. Do not use delay cycles. Remove baked bread from pan, and cool on wire rack. 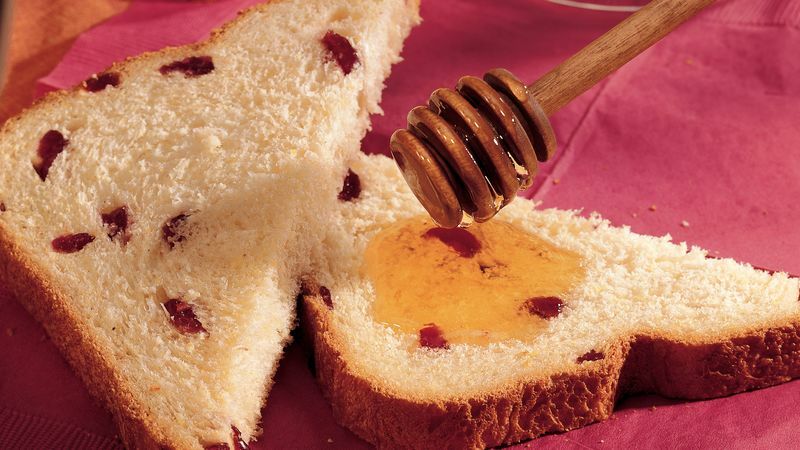 Change the look of this bread by using white cornmeal instead of yellow and replacing the dried cranberries with dried blueberries. Leftover slices are even more heavenly when they’re used to make French toast. A sprinkle of powdered sugar and a drizzle of warm maple syrup make it an irresistible treat!